The remains of dozens of presumed casualties of the Korean War are back on U.S. soil following an emotional ceremony in Hawaii. Vice President Mike Pence presided over the return of the remains. Members of the U.S. military carried 55 boxes draped with American flags off C-17 aircraft and into a hangar at Joint Base Pearl Harbor-Hickam. The U.S. military will take the remains to a laboratory at the base for identification. The remains are expected to mostly be American, though may also include servicemen from other United Nations member nations who fought alongside the U.S. in support of South Korea during the war. The boxes are believed to hold the remains of servicemen from the U.S. and other United Nations member countries who fought to support South Korea during the war. 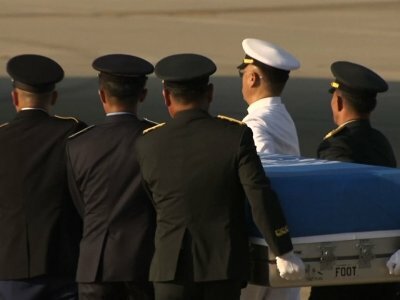 The remains of servicemen who are presumed American casualties killed in the Korean War more than 60 years ago have arrived in Hawaii. The remains are contained in 55 cases draped in American flags. Honor guards carried the cases off two military transport planes. They were flown to Pearl Harbor on Wednesday from South Korea after North Korea released the remains last week. The painstaking process of trying to identify the remains will take place at a Department of Defense lab at Pearl Harbor. U.S. Vice President Mike Pence oversaw the somber military ceremony. He said that while some call the Korean conflict the “forgotten war,” today’s repatriation proves the American soldiers were never forgotten. Vice President Mike Pence is meeting with the top U.S. commander in Asia before he participates in a ceremony marking the arrival of remains believed to be of servicemen from the Korean War. Pence on Wednesday met with Adm. Phil Davidson at the headquarters of the U.S. Indo-Pacific Command in Hawaii. Davidson thanked Pence for coming to Hawaii for the ceremony. Pence is expected to speak at the ceremony, where he will formally receive 55 boxes of remains. Dozens of boxes of remains from the Korean War are on their way to Hawaii for analysis and identification. U.S. Vice President Mike Pence and the commander of U.S. forces in Asia, Adm. Phil Davidson, are expected to speak at a ceremony on Wednesday. The event will mark the arrival of the remains on U.S. soil and the beginning of a long process to identify the bones. North Korea handed over the remains last week. A U.S. military plane made a rare trip into North Korea to retrieve 55 cases. Decades after the end of the Korean War in 1953, the remains of dozens of presumed U.S. war dead began their journey home following a repatriation ceremony in South Korea on Wednesday. North Korea handed over the remains in 55 boxes last week and allowed a U.S. military transport plane to move them to the U.S. Osan Air Base near Seoul in South Korea. While it was an apparent goodwill gesture by North Korea toward the United States, the return comes amid growing skepticism about whether the North will follow through on its pledge of nuclear disarmament. The remains were moved in vans to an airfield where U.S. and South Korean soldiers loaded them one by one into two transport planes. Four U.S. fighter jets flew low in a tribute.